The KODAK VISION3 Film family has raised the bar for high definition capture with unrivaled highlight latitude, reduced grain in shadows, flexibility in post, and, of course, proven archival stability. Now, with the addition of KODAK VISION3 200T Color Negative Film 5213/7213, we�ve developed a film that performs superbly in both controlled interiors and in challenging high-contrast exteriors. VISION3 200T is a 200-speed tungsten film that provides the image structure of a 100 speed film with the versatility of a 200 speed product - offering you the benefits of two films in one. Experience the improved extreme exposure performance and consistent VISION3 Film family look. Enjoy the added flexibility and increased creative control that comes with all the detail captured in the extremes of exposure. Benefit from the value in time and money that can be realized both on set and in postproduction. 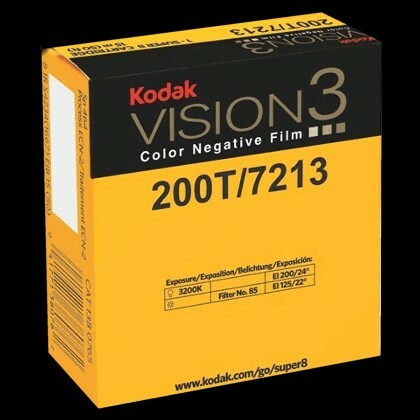 With the addition of KODAK VISION3 200T to the VISION3 Film family, we have once again proven the value, possibilities, and power of film. It�s time to look forward to the future with more options and no compromise. # ARE THE EXACT SAME MOTION PICTURE STOCKS OFFERED IN 16MM, 35MM AND 65MM FORMATS. # BENEFITS FROM A HALF-STOP OVER-EXPOSURE. Please note we do not offer a Negative processing service but a number of commercial motion-picture laboratories provide a processing service for this film stock.